For those who prefer individual attention, our knowledgeable, dedicated trainers are available for personal training sessions -- customized for your goals and schedule. You'll progress through your Customized Movement Program in each session, addressing movement restrictions and weaknesses so you can avoid injury and unlock hidden performance gains. After your Functional Movement Screen, Body Composition Scan and Goal-Setting Session, we'll design a program just for you that will keep you excited about working out and moving toward your goals. For couples or friends who prefer to train in a 2x1 session with one of our expert trainers, we can accommodate you, as well. Our programs are designed in 12-week blocks for Strength, Total Fitness or Hypertrophy (muscle growth). 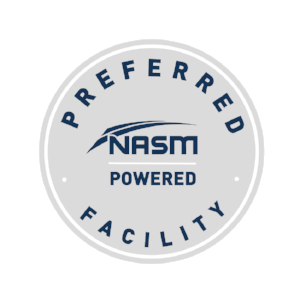 As the only NASM-preferred facility in Bayside, we follow its groundbreaking OPT (Optimum Performance Training) Model to help athletes of all ages and ability levels build a strong, stable foundation first and then unlock their potential. The workouts are varied and periodized, so you'll never get bored. You'll not only be able to see your progress, but also measure it with our workout tracking software. And our expert staff will be there for every rep -- motivating you, keeping you safe and sharing our expertise. Fill out the form below to schedule your Free Trial Session.